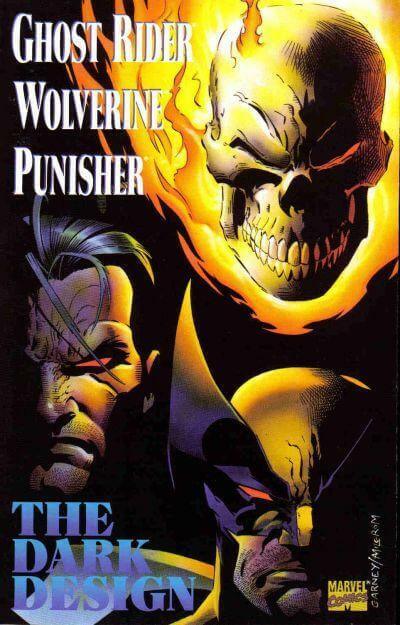 “The Dark Design!” Starring Ghost Rider, Wolverine and Punisher. Written by Howard Mackie. Art by Ron Garney and Al Milgrom. Wraparound Gate-Fold Cover. As Ghost Rider struggles to fight off Blackhearts supernatural corruption, the demon prince has taken Lucy to be his unholy bride and catalyst to his power as he challenges Mephisto, his father, for rulership of hell. Can Wolverine and Punisher fight their way through Blackheart’s minions in time to stop the unholy matrimony? And what of the tainted Spirit of Vengeance? Will the masters of the underworld finally collect that which they’ve sought for so long – the soul of the Ghost Rider?